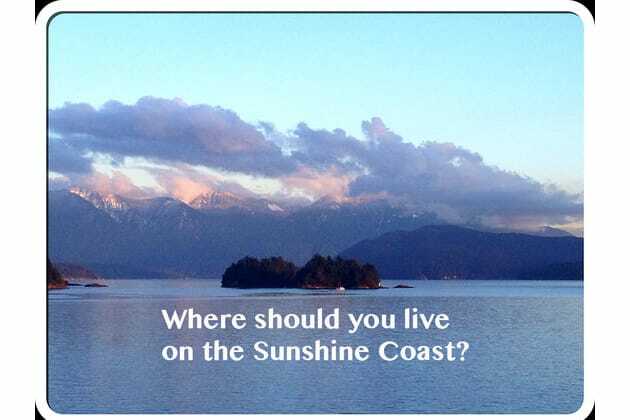 Where should you live on the Sunshine Coast? How do you move around day to day? Which do you identify more with? Take me back to the 60s! I want to go whole hog smalltown! How often do you need to head off-coast? Never! Pull up the drawbridge. How wired do you need to be? Luddite and proud of it. No man is an island, but plenty of people want to live on one, including you! Gambier, Keats, Thormanby, Trail islands are a great place to get back to a truly old-fashioned far from the madding crowd lifestyle. Time to buy a boat! Gibsons is the perfect community for commuters, people who need to get into the city regularly, are active in the arts, or have a light manufacturing business. There's also marinas & moorage, great hiking/biking on Mt. Elphinstone, and plenty of shops and activities. Sechelt is one of the sunniest spots on the Coast. Known for the Davis Bay sea walk and community pier, Trail Bay waterfront, and jumping off point for Sechelt, Salmon and Narrows inlets. Our region's hospital is here, schools, Capilano University, and of course the Sechelt Nation, one of Canada's most entrepreneurial aboriginal communities. Sechelt is also home to many small suburbs ranging from strata and condominium neighbourhoods to single family homes spread out through Selma Park, Tuwanek, Sandy Hook, Sechelt Village and West Sechelt. This is also the air travel terminus for the Sunshine Coast. Roberts Creek, known as the Gumboot Nation, is a mix of hobby farms and food production to outer commute limit single family homes, co-housing, and beachfront homes from newly built to rustic old-timer cottages. Home to the annual Higgledy Piggledy Parade and Creek Daze, and the awesome Community Mandala, sustainability is a way of life here rather than a buzzword. Halfmoon Bay is a great draw for families, with a flat plateau of grid-based roads fanning out to join Redrooffs Road. A couple of funky neighbourhood stores, a cafe, Coopers Green Hall and one of the Coast's best beaches at Welcome Woods are all draws here. Elementary school ony; students choose between Pender Harbour Sr. Sec and Chatelech Sr. Sec for grades 8-12. Big lots, especially north of Redrooffs (5 acre lot sizes). Great for gardening. Great access to the beach, wildlife watching, hiking & biking. Ah, Egmont. Sleepy 9 months of the year and then May through early September busy with people coming in to hike the Skookumchuck Rapids, take a boat cruise to Princess Louisa Inlet, and workers commuting to logging camps and aquaculture farms in the area. Close to the Sunshine Coast Trail and backcountry, and there's a great pub/restaurant year round, and fine dining in shoulder & summer seasons at a nearby resort. In between all of these 'main' hamlets and communities are tiny enclaves of independent folk who like bigger lots or acreages, to be tucked away on one of over a half dozen lakes in the Pender & Ruby Lake area, and older settlements like Kleindale, Secret Cove and Buccaneer Bay, and Smuggler's Cove & Homesite Creek. It's a drive for everything (food, conveniences, services) but a lot more wildness and quiet. Everyone is different, and on the Sunshine Coast of BC, there are communities very different from each other. Factors like access to the ferry terminal, commutability for Vancouver, lot sizes, and being near services and population centres are just a few of the reasons selecting a community to live in comes down to. Take our quiz and find out where you belong!